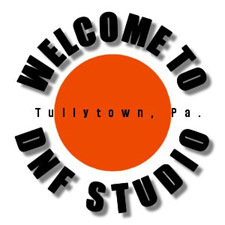 DNF Studio is a band rehearsal and recording facility located just off of Route 13 in Tullytown, Pa.
We are just minutes from Routes 1 & 276- the Pennsylvania Turn Pike. A short drive from anywhere in the Philadelphia and Trenton vicinities. Why pay $15.00 an hour to practice in a cramped, hollow sounding room in one of the many "practice mills" in the area, when for the same price you get the luxury of a large, furnished, climate controlled room, complete with stage riser, drum kit, P.A. system with mics & monitors, Satellite TV, Internet access and other accommodations?